All is fair when calamity strikes. 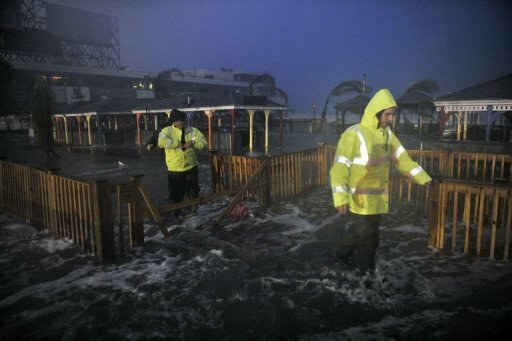 Barely a week before the most anticipated US Presidential election, Superstorm Sandy caused wreckage that devastated US populace, specifically those who live within New York and New Jersey. This brought me to the memories of Sendong last year. Going through calamities wasn't easy especially if you are severely affected. The stress it may caused you won't be compensated by the relief goods that you will receive. Indeed, such experience was so devastating. The land of milk and honey was not spared from Mother Nature's wrath. I just hope the said destruction has nothing to do with the so called eco-biological something that is manipulated by those who knew much about it. I just heard about it relating to what happened to Japan more than a year ago wherein a scientific methodology/processes was done to manipulate the abnormal weather condition that may cause massive destruction. Well, you can actually research more about it if you are interested. I do not know what lies ahead for US. Will the people be governed with a new President or Obama will still prevail. Whoever wins, I could only hope that the President-elect will do something to restore the storm-battered country and will give hope to those who are severely affected and those who have lost a family to start anew. After all, everything shall come to pass.